Best of 2015, 25 Best Amazing Text Effect Tutorials for Designers are for those who really love to make outstanding typography, calligraphy type artwork. These Photoshop tutorials will arm you with all the latest techniques to help you in your design creations. So why not check them out so you can show off your latest text effects designs. These high quality tutorials help to design amazing wooden, neon and glowing text effects with basic and advance tips and techniques. In this tutorial, you will learn how to creating a new piece that draws on all that’s great about the city – taking inspiration from last year’s Olympics, underground club scenes, and the vista from up high. This tutorial will show you how to modify a brick texture for the background, and then use layer styles with the Pen Tool to add some bright, glowing neon text and a simple cable over it. In this tutorial, I will walk you through the steps to create this 3D Snowy Text Effect Using Cinema4D and Photoshop. We will render the 3D text in Cinema4D, then apply the snow effect in Photoshop. In this tutorial, I will walk you through the process of making a yummy sweet text in Photoshop. We will use the basic tools and effects along to achieve the final outcome in short time. In this tutorial, we’ll learn how to create a smoke text effect in Photoshop in just a few easy steps. We will be using the Smudge Tool to make the text look like smoke. This tutorial will show you how to create a simple metal text effect using layer styles. Then, it will show you how to make that text look more interesting by adding a simple texture overlay to it. The sign will be created as a standalone piece of text, using Photoshop’s powerful 3D tools to simulate a hyper realistic setting within a warehouse. We’ll then add lots of subtle lighting effects to add a series of bright bulbs. In this tutorial, I will show you the methods I use to Create Abstract Shining Text Effect with Groovy Font in Photoshop. This is a beginner level tutorial with lots of tips and tricks about effective text manipulation. In this tutorial, I will show you the steps to design this abstract text effect with pen tool and grunge brush decoration in Photoshop. Along the way, we will practice using Pen Tool to draw some nice hair-like lines, as well as apply grunge brushsets for some cool abstract effect for our texts. In this tutorial, I will show you the processes of creating this Deep Space Text Effect in Photoshop. We will use a handwriting font, combine it with nebula and fire textures to form the final effect. In this tutorial you will learn how to create ‘Spectrum’ poster. Starting with custom made type in Illustrator, we’ll move our vector graphics into Photoshop for some serious distressing with Photoshop brushes, blending modes and more! After seen the Iron Man 3 trailer, it looks quite spectacular! So, to celebrate the upcoming release of Iron Man 3, and learn how to create a neat Iron Man inspired text effect in Photoshop. 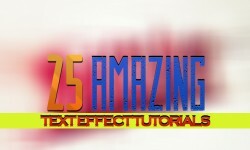 In this tutorial, I will show you the steps I took to Create a Glowing Liquid Text Effect in Photoshop. We will be practising the use of liquify filter, layer blending options, as well as some image adjustments. In today’s Illustrator tutorial we’ll take a look at the Appearance Panel and see how it can be used to build up layers of non-destructive effects that can then be saved as Graphic Styles so the effect can be instantly applied to any elements with just one click. In this tutorial, I will show you the steps I took to create this interesting cold winter night text effect in Photoshop. We will go through some texturing techniques, as well as an interesting method of creating break-apart effect. We will also use image adjustment layers to fine-tune the final effect. In this tutorial, I will show you the process of creating this dark text effect inspired by the action game “Middle Earth: Shadow of Mordor” in Photoshop. This tutorial will show you how to style and texture a rusty text, then add some flames using the filter, along with some other smoke and sparks textures to create a vibrant flaming text effect. This tutorial is designed to help you create cool neon text in Illustrator. Here you will learn some clever techniques to enhance your skills. In the following steps you will learn how to create a detailed cheese text effect and a cheese wedge illustration. For starters you will need a simple piece of text, the 3D Extrude & Bevel effect, and a simple Rounded Corners effect.